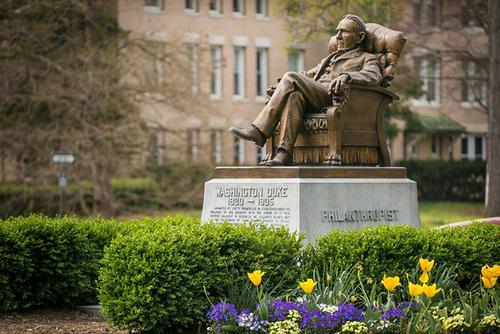 A statue of Washington Duke on Duke's East campus surrounded by tulips in springtime. A solid stock market and donations helped push university endowments to new heights last year. Across the state, universities reported good – and in many cases double-digit – market value growth. With an increase of 20 percent, Campbell University had the largest percentage increase. Because of its size, Duke University's endowment had the largest dollar growth, despite the lower percentage increase. At more than $8.5 billion, Duke's endowment is larger than the endowments of the next 13 universities – including UNC-Chapel Hill, Wake Forest, N.C. State, and Davidson – combined. Endowment sizes are tracked and reported by the National Association of College and University Business Officers in the 2018 NACUBO-TIAA Study of Endowments. Duke's endowment, managed by Duke Management Company, is the 14th largest endowment in the nation. The report tracks endowment sizes for the 2017-18 school year. During that time period, the S&P 500 index increased 12 percent and the Dow Jones Industrial Average increased by 13 percent. Endowments are invested in a variety of ways, including the stock market. The changes tracked in the report show only changes in overall value, which can grow from gifts or decrease from spending in addition to changes from investment gains and losses. Endowments fund scholarships, professorships, capital projects, and other university endeavors. Because they are intended to last in perpetuity, investment leaders tend not to focus on one-year returns, choosing instead to look at longer time horizons that determine payouts and set long-term strategic planning. University endowments across the nation took a hit last year, and North Carolina’s universities were not spared. Among North Carolina universities, six of the seven largest endowments declined in value. Duke University experienced the largest decline as its endowment fell 6.3 percent to $6.8 billion as of June 30, 2016, the end of the fiscal year. After years of rapid growth, endowments for both Duke University and UNC-Chapel Hill took a hit last year.